The Children who flew Virgin Atlantic flight VS011 from Heathrow to Boston this past weekend, had a flight they never will forget. Upon boarding the plane, each passenger received a Windows powered tablet. The kids on board used their slates to track Santa's annual journey via the North American Aerospace Defense Command (NORAD) Track Santa service. As the plane passed by the coast of Greenland, projections on the ceiling of the cabin made it appear as though Santa had landed on the top of the plane. Saint Nick then walked through the aisles of the plane, talking with the kids and taking selfies with the passengers. The kids then watched as Santa prepared to take off so that he could resume his journey. 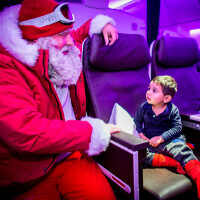 Santa's appearance was the result of a partnership between Virgin Atlantic and Microsoft. Both companies worked together to offer something that the children on board will talk about forever. You can watch all of the magic by clicking on the video below. And if you find yourself shedding a tear or two, it's perfectly okay. It just means that you're human. Good to see Microsoft putting forth good marketing effort into their product. Good old Micro$oft marketing on children (poor) and education yes... Really hope this company will die one day and quickly, hopefully by being Eloped. What kind of sick person would think like that? If Microsoft will die 126,000 people around the world would loose their job. Agree. Hope Microsoft new leadership would do more good. They would find new jobs, hopefully making up for their time doing evil at Microsoft, by going to better companies that do something that authentically contributes to the world vs. just maintaining a parasitical monopoly. "... by going to better companies that do something that authentically contributes to the world " That would mean they'd have to go to a non-profit organisation or a much lower-paid job. You don't want that, do you? How can you call the employees evil when most of them are working their asses off for money? Not the biggest comment of the day. You give anyone anything for Christmas? Marketing or not, they did a good deed. Hear of any other company donating millions to good cause? You need to get a life other than bashing companies. It seems that the big US tech companies (Apple, Microsoft) have nothing to offer except marketing videos that prey on human emotion. I swear you're like the biggest troll on the planet, if its not Google then its evil , such a dud you are. This is a better marketing technique than bashing and making fun of other companies in ad videos. Good luck Microsoft. They gave a lot of stuff for free!!! This is important. The rumored Mini version of Surface Pro 3 is gone. Will they really release one?